From just observations it is clear that Centennial woods is not an old growth forest, most of the trees appear to be adolescents ( mostly maples and white pines). Centennial woods has not always been a part of the University of Vermont, and it has also not always been a forest. The sandy soil found in parts of Centennial woods can be traced back to when the Champlain sea took residence on the land. 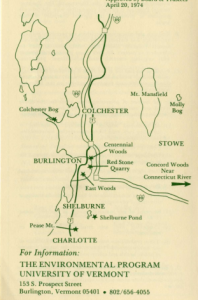 There most likely was Abenaki and European settlements along the river that was once more The land was owned by C. Baxter Est., H. Stevens, a white man who most likely used the land for agricultural reasons. There are still stone walls that can be found that can be traced back to when the woods were a farm. The oldest part of the forest is most likely 1860 when the farm was abandoned, and UVM officially bought it in April of 1974. This entry was posted on Saturday, December 8th, 2018 at 7:19 pm and is filed under Uncategorized. You can follow any responses to this entry through the RSS 2.0 feed. Responses are currently closed, but you can trackback from your own site.